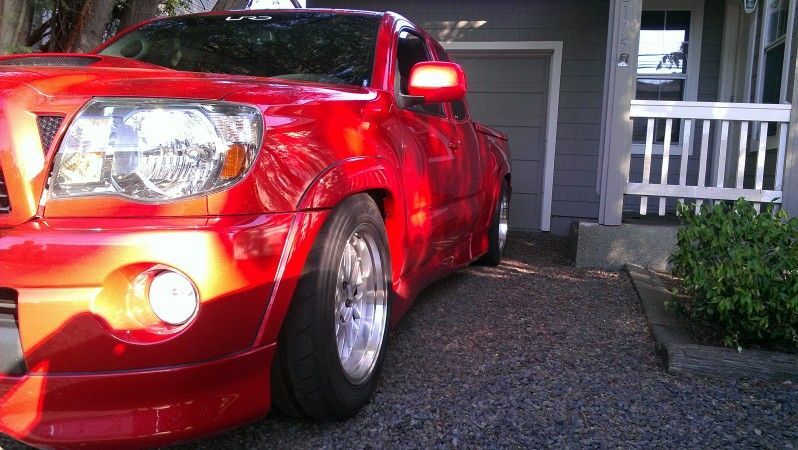 2011 Barcelona Red Tacoma X-Runner, Low miles, heavily modified. 4.0L 1GR-FE V6, TRD Supercharger with URD 2.825 Pulley, URD TCAI, NST Overdrive kit, Doug Thorley Long Tube Headers, URD Y-Pipe, URD Cat Back Exhaust. URD Stage 3+ clutch and lightweight steel flywheel. Modified TRD short shift. Not Installed but will include URD Fuel pump upgrade. (included in sale will be Stock Headers, Y-Pipe for emissions purposes) I also have the stock intake manifold, Air filter if requested. Inner Fender walls trimmed, Fenders rolled and pulled. Snug Top Toneau Cover with locks. Varrstoen ES111 18x10.5 rims with Nitto NT05 295/45R18 with only 2,000 miles on them. Windshield tinted 35, driver and passenger windows 15, back and cab windows Limo. Innovate steering wheel gauge pod, Defi Boost gauge, Innovate LC-1 Wideband Gauge (Blue LED). 6inch Kenwood touch screen deck with blue tooth integration and steering wheel controls still work, front and rear doors have been sound deadened. Front and rear door speakers Polk Audio with JL XD 400/4 amp, Custom sub box with JL W3 with JL XD 600/1 amp. Front suspenion, DJM upper and lower control arms, XII performance stiffer stock height springs. 3 inch drop in the front. Rear suspension DJM drop block, QA1 18 way adjustable shocks. 4 inch drop in the rear. Front XII sway bar, Rear adjustable XII sway bar. URD Ladder type Traction Bar. Minor scratch on the right rear fender flare from trimming. Most body kit pieces have minor scraps on the bottom of them from speed bump and other obstacles faced with a lowered vehicle.